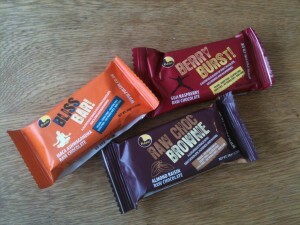 These 3 Gluten (and Diary and Soya) free raw chocolate bars are a great way for chocolate lovers on a gluten free diet to indulge whilst remaining health. Until recently I only saw them at health food shops but when a local supermarket started selling the “Bliss Bar”, “Berry Burst” and the “Raw Choc Brownie” I took the opportunity to buy and try all three.. twice. As well as being Gluten Free all three bars are made using only natural ingredients and are suitable for people on a raw food diet as none of the ingredients are heated above 40c, the Chocolate is Raw as it is cold pressed instead of being roasted which preserves natural antioxidants that are usually lost during the roasting process. 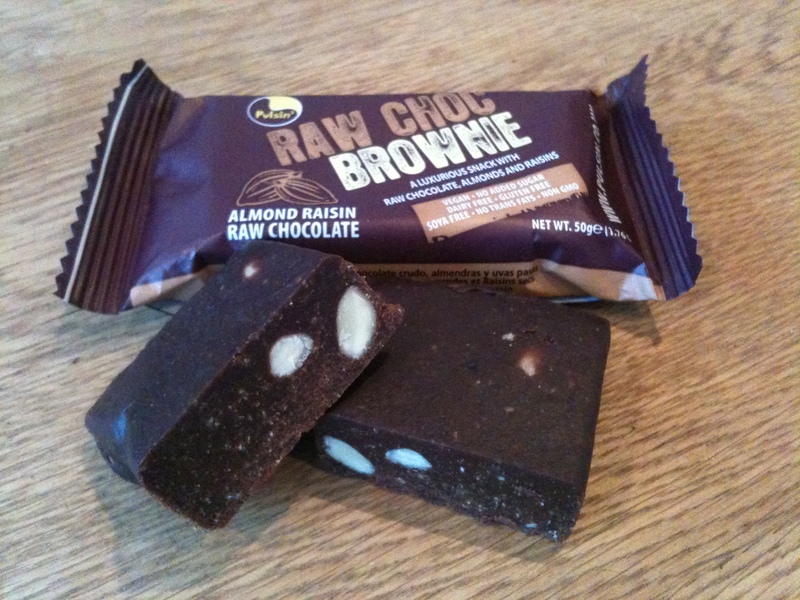 This was the first one of these I tried and my favourite of the three, the “cake-y” texture of the Raw Chocolate combines really well with the juicy raisins and almonds and the aded vanilla does gave it the taste of a real brownie. As with all Pulsin products its made using 100% natural ingredients and is about as good for you as a Chocolate-y treat can be, It’s high in protein, enriched with raw rice protein powder which will help balance blood sugar, has the anti-oxidants (substances that may help to fight free radicals and are thought to help prevent disease) from the raw cacao and added health benefits from the mineral rich almonds and high fibre raisins. 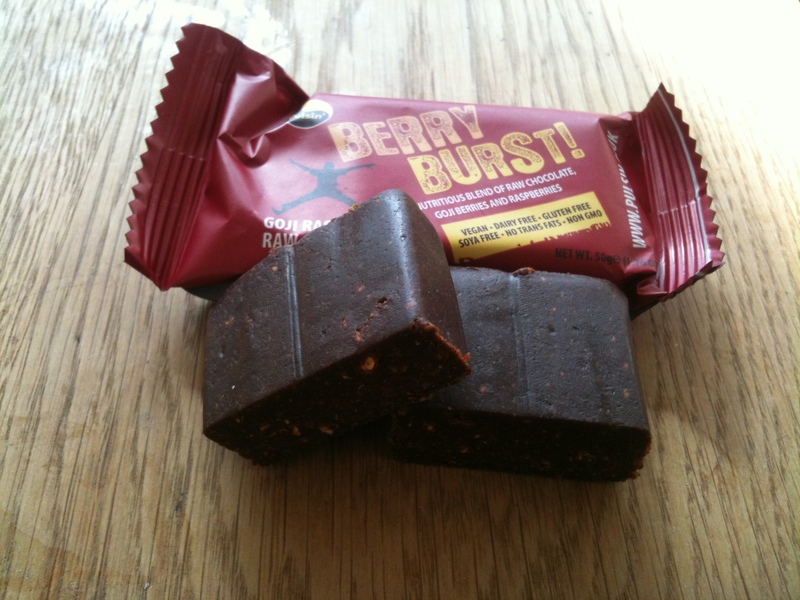 I really like this bar and it’s a handy snack to have a few of in the cupboard as its just as good as a breakfast treat as it is as a dessert. This Bar is again made with some interesting choices of ingredients including Maca, Ashgawandha and Green Tea Extract, all three of which are reputed to have immune system strengthening, energy giving and libido enhancing effects. 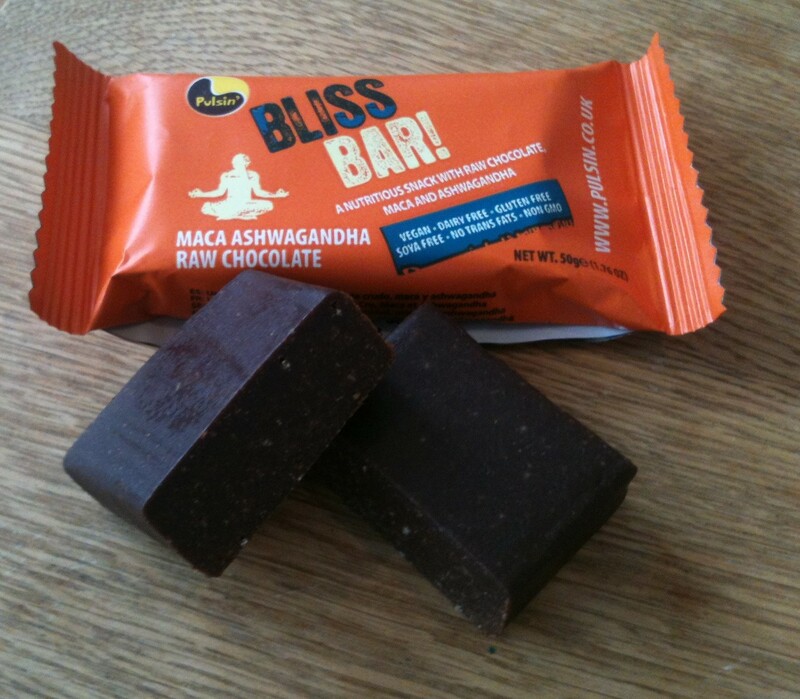 I can’t think of anything else I’ve eaten with a similar taste to the combination of herbs mixed with the gooey Raw chocolate found here, its quite rich and although it may be placebo I did feel that it worked as a pick me up having a similar effect to a strong cup of coffee. I didn’t like this quite as much as the Brownie but its defintely a snack I can see myself eating regularly as a dessert or mid afternoon treat..
All of their products are made with using artificial sweeteners, flavourings, preservatives or colourings as well as being low in sugar relying on natural sweeteners like dates, brown rice malt, agave nectarand xylitol. As well as being better for your waistline this should reduce the likelihood sugar crashes, cavities and afternoon cravings. All Pulsin products are also high in protein so suitable for people looking for a pre- or post-exercise boost, People watching their weight and looking to burn fat without losing muscle or anyone recovering from illness. Article posted in Bars, Products, Snacks on March 26, 2014 by Ray Smith. 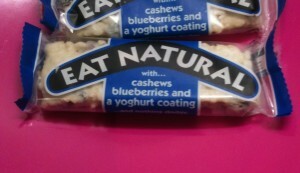 It’s getting easier and easier to find a wide variety of Gluten Free cereal bars in shops all over the UK. 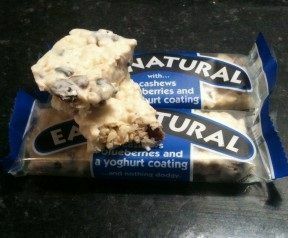 Many of them made by Eat Natural who have a range of Gluten Free bars that are available singly in lots of shops around the UK or in multi packs that you’ll find in larger supermarkets. They sell 10 different bars in total that are Gluten Free (and three that aren’t). 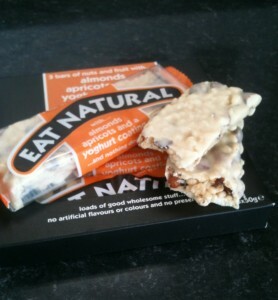 Another one of my favourites is their Yoghurt, Almond and Apricot bar. Cereal bars can be a total lifesaver as something you can quickly grab from the cupboard or desk drawer and throw in your bag or pocket to take out with you to have with your lunch or as a snack in between meals. The taste of the yoghurt coating is probably the first thing you will notice and its creamy, milky, sweet flavour with a hint of vanilla is a good start. Following the coating the next most distinctive flavour is the fruit – Blueberries, Cranberries and Apricots with the taste of the juicy, sweet (and healthy) Blueberries dominating. There are a good selection of savoury ingredients that ensure the bar isn’t too sweet or soggy, chopped Cashew and Brazil nuts, Puffed Rice and Shredded Coconut. 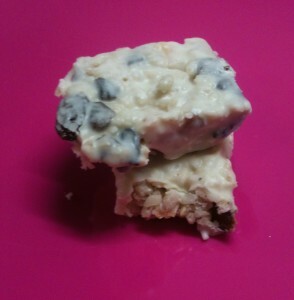 These combine with the yoghurt and the fruit to give a enjoyable moist yet crunchy texture. There is a good amount of everything, no one ingredient dominates and the combination of flavours works really well. The mix of all these different ingredients results in a really tasty bar which, unlike other cereal bars, won’t get smashed into tiny pieces in your bag or disintegrate into a shower of crumbs that goes all over the floor or your desk when you try to eat it. I usually choose the 50g size, depending on your appetite you may find that this is enough to completely replace your breakfast or lunch. For me it is pretty much perfect as an in between meals snack or addition to my lunch. I make sure I have few of these in stock at home and in the office all of the time, as well as being handy to take out on a journey or fill the gap between meals they are a great safeguard against those times when I get an insatiable craving for something sweet and a indulgent and may be tempted to have something incredibly bad for me or non Gluten Free. One of these will satisfy my sweet tooth’s cravings for at least a few days. Like all the other products in the Eat Natural range (in addition to bars they make a range of Gluten Free cereals and mueslis – Gluten Free Buckwheat Muesli review here) these bars are free of artificial colours, flavours and preservatives and are made in the UK. Article posted in Bars, Products on December 10, 2013 by Ray Smith. This Gluten Free (but also wheat, gluten, yeast and egg free, it may contain nuts however) bar is a bit different to most of the other cereal or breakfast bars on the market because of the unusual choices of ingredients it’s manufacturers – Wholebake – have made. As well as the Hemp seed that all of their bars contain and which gives them their name as it contains all of the nine essential amino acids that are the building blocks of life and cannot be made by the body, this bar also contains Flax seed and is coated with Carob. Flax seed is considered a “Super Food” due to the high amount of nutrients it contains. It’s technically not a grain, although it has a similar amount and type of vitamins and minerals to grains but has considerably more fibre, antioxidants, and Omega-3 fatty acids. It’s also very low in carbohydrates, so perfect for anyone limiting the amount of carbs they consume and its ability to help you feel full and satisfied due to the amount of healthy fats it contains and its high fibre content make it a great food for anyone trying to drop a few pounds. Carob is used here as a substitute for chocolate, it has a similar colour to chocolate and a somewhat similar taste. Although slightly higher in Carbs and sugar than chocolate it contains no caffeine, is much higher in Calcium and lower in fat. This bar contains no trans fats, artificial additives, preservatives or colours and like all 8 Nine Bars is handmade in Wales. There’s the stats, now its time to review the taste. The added honey makes it just sweet enough but not overly sugary or sickly, the Carob although a bit of a different taste to a high cocoa chocolate is still pleasant and not a million miles away from the taste of the milk chocolate many cereal bars use. The mix of seeds taste really good, particularly the hemp which has a similar taste to pine nuts. So, if youre looking for a convenient snack that’s Gluten Free and a bit different these come highly recommended, most UK supermarkets sell them in a 4 x 40g multi pack and they also come in a slightly larger 50g size, which I’ve only managed to find in Holland and Barrett. If you do try them and like them its worth trying others from the range which has 8 different bars in total. Article posted in Bars, Products on September 3, 2013 by Ray Smith. Lunch can be the most difficult meal time to plan for anyone on a Gluten Free diet, especially if you need to take a Lunchbox to school or work. Cereal bars can be really useful as something you can carry around with you to have with your lunch or as a snack in between meals but of course they’re not an option if don’t eat Gluten. Enter Eat Natural who have a range of Gluten Free cereal bars that are available singly in lots of shops around the UK or in multi packs that you’ll find in larger supermarkets. They sell 10 different bars that are Gluten Free (and three that aren’t). All of their bars and other products are free of artificial colours, flavours and preservatives and made in the UK. As well as bars they also make a range of cereals and mueslis. I’ll be reviewing other Gluten Free cereal bars soon but decided to start with this one as it’s one of my favourites and obviously other peoples too as it’s Eat Natural’s best seller, it’s a mix of Apricots, Almonds. Coconut and puffed rice in a Yoghurt coating. The taste of the yoghurt coating is probably the first thing you will notice and its creamy, milky, flavour with a hint of vanilla is a good start. Under the coating are the almonds, coconut, apricots, and puffed rice , no one ingredient dominates and the combination of these flavours works really well. The juicy, sweet apricots combined with the crunchy whole almonds gives the bar a really enjoyable texture, and the nutty flavour of the almonds offsets the sweetness of the yoghurt coating and apricots nicely. The other ingredient you will taste is the coconut, which again tempers the sweetness well. 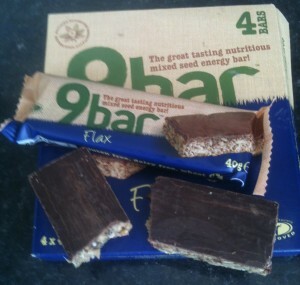 The mix of all the different ingredients results in a really enjoyable bar. This is recommended as a handy snack you can carry around with you as part of a packed lunch or something to eat before or after some physical activity. A word of caution though, this particular bar is very sweet, the Yoghurt coating, though delicious, almost tastes more like icing than Yoghurt and it is quite high in fat and sugar so it might be better to view it as a slightly healthier more virtuous replacement for a chocolate bar rather than healthy muesli in bar form. I usually go for the 50g size and like to have a few of these in the cupboard all the time as a safeguard against those times when you feel like something sweet and a little bit indulgent and may be tempted to have something non Gluten Free or when you are heading out and want to grab something to throw in your bag in case hunger strikes. One of these will satisfy my cravings for at least a few days. Article posted in Bars, Products on August 29, 2013 by Ray Smith.